Sotheby's, Hong Kong, 28 October 1993, lot 1269. 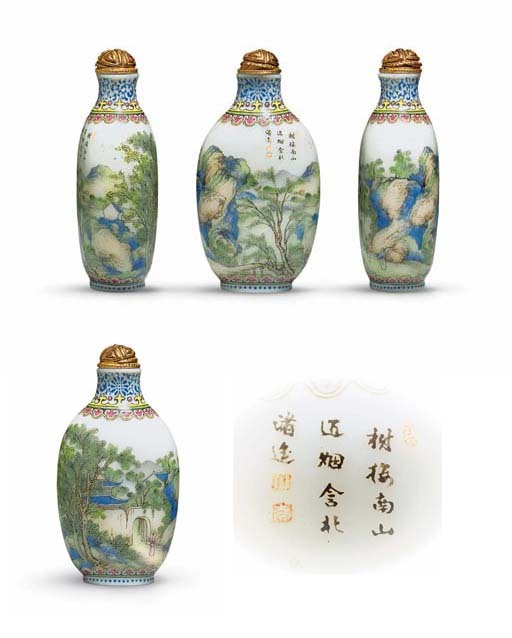 This bottle is one of a very small group of early Qianlong-period painted landscape and poem designs. Another example is also in the Meriem collection, while a third was offered at Etude Jutheau, Paris, 5-6 March 1985, lot 68, and one more is in a private Hong Kong collection. They represent the finest of eighteenth-century enameled landscape painting and are rare exceptions to the normal range of subject matter found on Palace enameled glass wares. Despite their rare subjects, however, the quality of the milky-white glass and of the enamels, and the exceptional skill involved in the painting, and the cursive inscription with seals all identify the work as having been done in the Palace workshops during the first half of the reign. On close inspection, the enamels also exhibit the typical tiny-scale firing problems typical of early enameling on glass at the Palace workshops. This bottle is unmarked and there is no evidence of it ever having had a mark, which is unusual for Imperial products of the early Qianlong period. The rendering of the figures and the shading of the mountains in the distance are similar to the painting found on a small enameled glass cup bearing a Qianlong mark, from the Jingguantang Collection, sold our Hong Kong Rooms, 3 November 1996, lot 509. See under lot 617 for a discussion on the difficulties in producing enameled glass.